Follow the link below and search based on your zip code to find a screening of this wonderful film in your area. In “They Shall Not Grow Old,” Jackson opens a window to the past in a way that has never been seen or heard before, noting, “Restoration is a humanizing process.” The screening will be immediately followed by special content offering firsthand insights into what went into this groundbreaking feat of research, filmmaking and storytelling. Type in your zip code and the system will provide the nearest theatres. Oscar-winning filmmaker Peter Jackson‘s latest labor of love, which he made for free, is the World War I documentary, They Shall Not Grow Old. The stunning technological and historical achievement documents the lives of soldiers fighting in World War I brought to life using archival historical footage restored to near high-definition standards, complete with hand-colorized updates. The WingNut Films production, complimented with archival material provided by the BBC and London’s Imperial War Museum, will be making its premiere at the BFI London Film Festival followed by a U.K.-wide release of the 2D/3D film by Trafalgar Releasing on that same day, October 16th. The film is part of the World War I centenary’s official program of cultural events known as “14-18 NOW”, funded by contributions from the British lottery, the government’s department of culture, and the Arts Council. 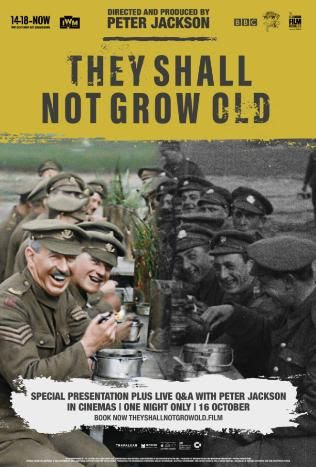 They Shall Not Grow Old will also be distributed to all of Britain’s secondary schools after release. You can get an early look at the incredible restoration of these 100-year-old film strips in the first trailer for the documentary, along with commentary from Jackson himself. In the above first look, Jackson confirmed that though computer technology may have smoothed the transitions between the frames of the old film strips, none of the visual material presented was created by the production team. Instead, the century-old film stills have been restored and colorized, with modern audio filing in the sensory gaps and, perhaps most interestingly of all, professional lip-readers weighing in on what they believe the soldiers’ dialogue to be, along with actors lending their voices to the brave members of this formerly black-and-white generation to bring them back to life. Impressive stuff. This entry was posted in They Shall Not Grow Old and tagged They Shall Not Grow Old on December 4, 2018 by Michael K. Barbour.